Euroset, the Russian company, has begun exclusive distribution Android smartphone, Acer beTouch E110. This handset was announced at the Mobile World Congress 2010. It is an entry-level phone. Acer beTouch E110 has a 256K colors 2.8” resistive touchscreen with resolution of 320×240 pixels (QVGA), Android Cupcake OS, ST Ericsson PNX6715 416MHz processor with 256MB RAM and 256MB ROM memory, 3G and GPS connectivity, a 3.5mm audio jack, a 3.2MP camera, FM tuner. 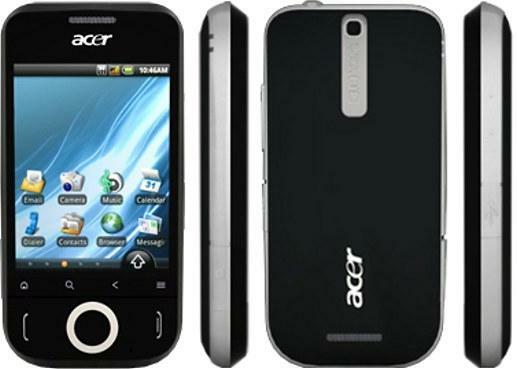 Acer beTouch E110 comes with 300MB of GPRS traffic, which can be used within three months (100MB per month).It is pre-loaded with Nemo Player, Acer Spinlets application for streaming multimedia content, Acer UrFooz, and Twidroid Twitter client. The cost of new Acer beTouch E110 is 7,990 rubles (around 5,300 INR) and is available currently in russia. Tags: Acer beTouch E110, Acer beTouch E110 review, Acer beTouch E110 multimedia features, Acer beTouch E110 features, Acer beTouch E110 details, Acer beTouch E110 specifications, Acer beTouch E110 information, Acer beTouch E110 images, Acer beTouch E110 pics, Acer beTouch E110 pictures, Acer beTouch E110 hardware features, Acer beTouch E110 software features, Acer beTouch E110 application features, Acer beTouch E110 availability, Acer beTouch E110 price, Android Smartphone.